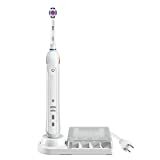 The Oral B Pro 3000 electric toothbrush with Bluetooth Connectivity is the most recommended electric toothbrush just like the top Oral B and Sonicare models. It is also quite suitable for people with sensitive teeth because it features a sensitive mode that operates at a lower speed for cleaning your teeth and gums gently. It, however, lacks the deep clean, tongue cleaner, and the premium travel accessory. But, does the 3000 tick all the boxes of versatility, effectiveness, and reliability? Does it actually perform as it promises on the tin? There is only one way to find out. Scrutinize the product description and analyze feedback from users of the Pro 3000 in addition to seeking the opinion of industry experts. The Oral B Pro 3000 electric toothbrush is clinically proven to be a far more superior way to clean your teeth than a normal manual toothbrush. The 3000 removes 100% more plaque than manual toothbrush can achieve Dentists recommended that you should brush your teeth for at least two minutes. Most people can hardly sustain brushing their teeth for a minute. An electric toothbrush overcomes this barrier because it is electrically set to brush for at least two minutes. The 3000 is a quality brush that has 3D capabilities. It clears 97% of plaque in hard to reach places due to its 3D functionality. The 3D basically refers to the ability of the oral b 3000 pro to pulsate and rotate at the same time (simultaneously) for an all round clean. Helps you steer clear of gingivitis. Indeed it can reverse the effect of gingivitis if your teeth are already affected. As a bonus, the oral-b pro 3000 whitens your teeth naturally in a span of 21 days. Good for sensitive teeth because it has a pressure sensor that will sense whenever you brush too hard so that you can adjust the setting to reduce sensitivity. It is powered by a battery that cans last seven days when fully charged. Has a charger base that can hold up to four brush-heads such that all members of the family can use one electric toothbrush but with different respective brush heads. This can you save money you could have spent on buying new electric toothbrushes for all the members of the family. Comes with a reassuring 60-day return policy and two years guarantee. As you can see, there is a lot riding on this toothbrush. Oral B is the number one most recommended toothbrush by dentists worldwide. We believe that the Oral B is good value for money because it will increase your teeth cleaning regime and not only improve the overall health and hygiene of your teeth but also whiten them for that radiant smile that will effortlessly improve your confidence. The charger base can be a little cumbersome to position especially if you have a small washroom. It can, however, contain four brush heads as pointed out above. You only get one brush head when you buy the Oral-B 3000. You would have loved to get a number of brush heads to last you for a while before you start thinking of replacement brush heads. The gum care has a massage functionality that gently stimulates gums while the sensitive function enables the Oral B Braun 3000 to run at a slightly slower oscillation rate to soothingly clean sensitive gums and teeth. Needless to say that the sensitive operational mode is quite perfect for people with sensitive teeth. The daily clean is where all the works happen. It features a pressure sensor that alerts you if you are cleaning too hard. It also has the 3D tilted movement of angled bristles for a proper clean. The 3D cleaning is independently been proved to reduce gingivitis by 20%. The Whitening functionality whitens your teeth by several sheds. This happens with continuous use to give your teeth a radiant white look and feel for that confident smile you deserve. Your teeth will be at least a shed whiter after only 21 days. This power toothbrush is one of the best electric toothbrushes for sensitive gums. So if you have sensitive teeth, this is the brush for you. It has bristles that fade off to indicate that the brush is due for replacement. And, unlike other electric toothbrushes; this brush employs pulsating technology which breaks down plaque more effectively. The rotating and oscillation movement coupled with so many strokes provides a complete deep clean that that removes all residues. Check its user guide here. The Oral-B Pro 3000 is quite powerful because it pulsates at 40,000 strokes that oscillate at over 8800 motions per minutes. This is sure to effectively dismantle any etched in plaque. The Pro 3000 also has a waterproof handle that also displays the charge level. Regulates the pressure at which you are brushing. It does this by using the pressure sensor. In case you are brushing too hard, the visible pressure sensor will notify you that you are exerting too much pressure so that you can regulate the pulsation to protect your gums. This is good for sensitive teeth. Operates on a rechargeable battery that can power the brush for up to two weeks when fully charged. The charger includes a smart plug while the brush head has cross action functionality. It has a timer that buzzes in the frequency of thirty seconds to alert you when to move to the other quadrant in your dental structure. This time will also buzz when you have brushed up to the dentist recommended time of two minutes. Comes with a plug-in stand for charging your best electric toothbrush. This charging stand can hold four brush heads as already mentioned. This is clear evidence of the versatility of the Oral-B Professional Care 3000 Power Toothbrush. The 3000 Cross Action brush head means that the whole tooth will be thoroughly brushed because the bristles cover every part of the tooth. The crisscross soft bristles tilt at an angle of 16 degrees and also have a 3D component that oscillates and pulsates for a proper deep clean. This capability alone enables the toothbrush to dismantle up to 97% of plaque from those tricky places that a manual toothbrush will not reach. When you buy your Oral-B Pro 3000 this is what you will get in the box. You might be asking, yeah, this Oral-B Professional Care 3000 has all these cool features but what do they actually mean to me, what is for me in there? Well, there is a reason why the oral b toothbrush 3000 is one of the top-selling electric toothbrushes. Here is a sample of why it is considered a top toothbrush in the dental care industry. Why Is It the Top Selling Toothbrush? Has features that are recommended by dentists because they keep your teeth and gums in ship-shape condition. For instance, the sensor lets you know when you are brushing hard so as to adjust your brushing. Brushing too hard may agitate your gums and damage them as a consequence. The 30 seconds reminder enables you to brush your teeth evenly because it will indicate to you when to move to the next quadrant so that you don’t spend more time on one quadrant of at the expense of the other. The sensor ensures that you are brushing at optimum conditions for a good deep clean. The overall result of all this is that your teeth will be healthy and even several shades whiter. This will increase your self-confidence due to the radiance of your smile and also save you from visiting the dentist frequently. Its charger is quite good especially for people who travel a lot because it has a wide voltage range of 220-240 that is usually used in most countries in the world. Oscillates at a higher speed than any manual brush. All these multiple rotations easily break plaque and any other dirt on the teeth far much better than manual toothbrushes will ever be able to match. You can easily get the oral b toothbrush 3000 at discounted prices at Amazon. The oral b 3000 pro is the most affordable of all oral b brushes for sensitive teeth because it has the ability to slow down the speed of oscillation for a gentler cleaning session. Is the Oral B Pro 3000 Worth It? As you have seen, the Oral B 3000 ticks all the boxes of reliability, effectiveness and versatility. You can rely on it to reverse or prevent gingivitis. You can rely on it to give your teeth a proper clean to the required dentist specification of two minutes. It is effective. With the Pro 3000 electric toothbrush, you will effectively clean every quadrant of your dental structure. The device reminds you when the brush heads are due to be replaced so that you can replace them with effective deep cleaning. The Oral B Professional Care 3000 also whitens your teeth in just 21 days of continuous daily use for that confident smile that will give you a feel-good factor. Regarding versatility, it can be used for both sensitive teeth and normal daily clean. You can also use different brush heads by the same manufacturer. This gives a wide choice and an opportunity to go for what works for you. Different people can also use one Braun care 3000 electric toothbrushes provided you use different brush heads. The Oral-B 3000 is quite gentle on your gums and will enhance your overall dental care. There are no two ways about it, if you are looking for a way to clean sensitive teeth and you do not want to spend on more pricey electric toothbrushes, this is the real deal for you. Buy with confidence; you really have nothing to loose because this Oral B pro 3000 electric toothbrush comes with a 60-day return policy and a two-year guarantee. How about that for confidence? You cannot go wrong with this.